I had been planning to post the recipe of this wonderful dish from not sure how long, every single time I make this delicious Kozhi Nirachathu/Stuffed Chicken, I take pictures and save them but then compiling and editing pictures and composing this post took me for ever. Better late than never right?? 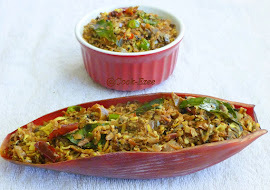 Kozhi Nirachathu is one of the most popular dishes of Malabar region of Kerala (Northern Kerala). The whole chicken is first marinated in spices and then either braised or broiled(even pressure cooking works). The broiled chicken is then stuffed with some boiled eggs well coated with sauteed onions, raisins and cashews. OK.. mouthwatering isn't it? The process is not done yet.. The whole chicken is then cooked in spicy onion tomato sauce to perfection. 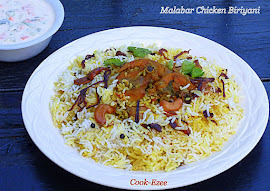 Now without delaying further let me go ahead a post this very delicious, Malabar Special Recipe - Kozhi Nirachathu - Akka Stuffed Chicken in Spicy gravy. First step is making the chicken ready for the preparation. Take out the chicken parts/giblets packet that comes with whole chicken from the cavity and set aside. Peel off the skin and make incisions on the whole chicken especially on chicken breast and legs. Squeeze a lemon/Lime, add a spoon off salt and apply all over the chicken. Wash the whole chicken one or two times and pat dry with paper towel. Make a marinade of items listed under marinate list. Marinate the whole chicken by rubbing all parts of the chicken and making sure the marinate get inside the incisions. Set aside for 1 or 2 hours. Reduce the heat to medium and Cover with a lid. Let it cook for seven-nine minutes. Open the lid and turn over the chicken slowly making sure the chicken don't stick onto the pan and start breaking. Cover and cook again for another five-seven minutes or until chicken is well cooked inside. Take off the stove and set aside. Heat up another frying pan, add coconut oil to it, add raisins and saute till it pop up, strain and set aside. Add cashews saute till golden, strain and set aside. Add curry leaves and saute for few secs, add onion, ginger, garlic and salt and saute till onion turns light brown. Add turmeric powder, chilly powder, coriander powder and saute well to blend everything. Add the garam masala and saute well to combine. Stuff this egg masala into the braised chicken cavity. Heat up a kadai, preferably the same one used for braising so that the gravy gets all the chicken flavor. Add more oil if required, add curry leaves, onions, ginger-garlic, green chilies and saute well till onion turns golden color. Add chopped tomatoes and saute till they are fully mashed up. Add turmeric powder, crushed fennel, chili powder, coriander powder, garam masala and saute well till everything is combined. Now add the braised whole chicken and spread the gravy on the whole chicken. Cover and cook on medium heat for three-five minutes. Drizzle some lime/lemon juice just before serving. Serve warm with Rice/Roti/Chappathi. Enjoy !! This looks too toooo good..yumm..
Its been ages i cooked whole chicken like this, my mouth is watering here.